If you call yourself a seasoned nightlifer I'm sure at least one of the units from Native Instruments' Kontrol series has caught your drunken gaze. Sitting on the sideline of your favourite DJs setup, the brands first unit the Kontrol X1 was anything but. Becoming a staple for groundbreaking headliners like Richie Hawtin, Dubfire, and JFK of MSTRKRFT the midi controller turned laptop DJing into a hands off approach by letting the user set cues, loops, sync, and effects in Traktor on a sturdy tactile interface. Next in line is the recently released Kontrol F1, the X1's colourful cousin. Taking the same avenue but this time with a bit more succession, the F1 transforms the computer DJ into a performer having too much fun to stare at a screen and check email. Offering a wide range of control instruments from knobs and sliders to a 4×4 grid of physical pads in the same high quality build Native Instruments has already proven in its ever expanding catalogue of DJ and production hardware. But there's more to it than just MIDI utensils, the Kontrol F1 is the first controller to fully incorporate the new Traktor Pro 2 remix decks function which is the company's latest answer to expanding the horizon from simply playing music to making music live. The good: Quick hassle free MIDI setup with Traktor Pro 2.5 included. A solid road-ready build with fluid knobs and faders. Plenty of pads that can be assigned a large range of beautiful colours with page up/down multiplying your mapping possibilities. Custom universal USB MIDI compatibility to control your favourite DAW or DJ software with your own mappings. Full expanded control of Traktor's new sample decks functionality with 1.4 gb in sample sets that allow you to remix as you mix on the fly. The bad: Pads are not velocity sensitive and their size may not be the best for MPC style drumming. Only one remix deck can be controlled at a time and Traktor Pro 2.5 only gives the F1 full control of its remix decks, this can easily be solved with upcoming future updates to the software. The deal breaker: Is in the meat and potatoes. A colourful 4×4 grid of pads, 4 knobs, 4 sliders, and more in a sturdy yet compact package adding a new layer of creativity to any DJ or live performer from the traditionalist to the controllerist. Native Instruments keeps the setup minimal but if you're someone that wants to break the barriers, the Kontrol F1 puts the ball in your court by offering the freedom to do what you want with endless possibilities to meet your custom needs. You don't need to use the Kontrol F1 yourself to see that it can play many roles in your DJ setup. Whether it be launching tracks, controlling effects, or layering extra samples on top of your set, in the right hands the Kontrol F1 can have many different uses. It's the sort of hardware that even the developers don't know exactly everything it will be getting into. 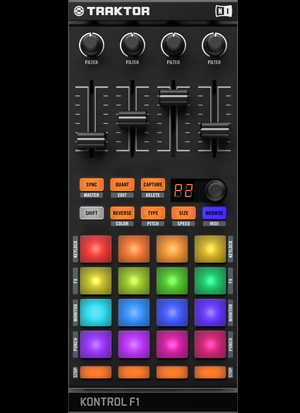 But if nearly limitless capabilities is a bit frightening, Native Instruments has laid out mappings in the included Traktor Pro 2.5 that have integrated the Kontrol F1 into your setup via the software's Remix Deck function. Remix decks sit side by side with your track decks, holding your samples that you can call with a simple stroke of a pad. Each of the four rows in Kontrol F1's 4×4 grid of pads represent a remix deck, and within each remix deck you can call up to 4 samples. Samples can be anything from one shots to loops, so the remix decks can be used to mash that air horn like a knob before a drop or sync a DJ tool that adds an extra groove to your mix. You can capture sounds and assign them to pads, or dig through the 1.4GB sample pack courtesy of Native Instruments that includes bass drums, snares, and hi hats for your set. To further expand the library, Native Instruments will be releasing remix sets of some of your latest rinses so you can make live edits, rearrange the layers, and redefine each individual song element on the fly. They will be offered through various music retailers and already include tracks like Tom Tago's "Rise Up" and M.A.N.D.Y. 's "Twisted Sister". In true holiday spirit, the developers have also released a series of 5 packs to stuff your sample stockings with deep house and more percussion, a great gift from a company that never stops giving. Now onto that rainbow catching your eye, the centerpiece of the Kontrol F1 unit, its rubberized pads. Colour coded to encourage workflow, the gorgeous grid can make the creativity seep out of you with its inspiring visual appeal. Native Instruments has done a stellar job of making a controller that is not only incredibly versatile in its functionality, but also mesmerizing to see, touch, and feel. It makes the mixing experience seamless, fun, and hard to let go. Quantize mode adds perfection to your performance, so you can stay on beat no matter how skilled you are on a live drum machine. But I must be quick to point out the pads are not velocity sensitive so don't expect the F1 to be your mini MPC. Small things like the page up and down options allow you to shuffle through different slates of mappings literally multiplying the possibilities while the shift function lets you assign key lock, legato, and FX to each of the sample decks. Check out the live teaser with Stewart Walker to get an idea of what your imagination could be stirring with the F1. Let's take a step back and look at the controls themselves. In essence the Kontrol F1 is a controller with 16 pads, 4 rotary knobs, and 4 sliders that can be mapped to any kind of MIDI software whether it be Traktor, Ableton, or studio programs like Pro Tools and Logic. This makes the Kontrol F1 an open ended piece of hardware, with custom mapping completely at your disposal. Control the send and automate the dry-wet knob on your favourite delay or launch clips from cue points and track their volume via the sliders, it can take whatever you can throw at it. Unfortunately if you're looking to map other controllers to Traktor's remix decks you're out of luck, as the Kontrol F1 is the only unit out there that is compatible with controlling the entire function in the software. Hopefully we can see Native Instruments open this up in future updates. When it comes to build and aesthetics, the Kontrol F1 sits on top of the midi controller market. One often plagued by weak knobs, loose sliders carelessly held together in a cheap plastic casing. Native Instruments has taken the more honorable approach to hardware with brawny components standing on a brush aluminum panel, the Kontrol is built to hit the road and it's not a surprise when you're outfitting DJs and live acts putting these units through the works nearly every week of the year. The smooth rubberized pads have a nice click to them and if you hit shift + reverse while plugging in the USB you'll unlock a charming hidden feature called "Vegas" mode, we'll let you find out what that does yourself. Overall the Kontrol F1 is a grab for nearly every kind of DJ as it can be slotted into any kind of setup. Plug it in to Traktor and fully utilize its Remix Deck function to call your own samples along your traditional turntable setup or go rogue and make your own custom mappings in Ableton to add some vigor to your live sets. What you want to do is really up to you, and that kind of freedom might be exactly what you need to take your mixes to the next level. The Kontrol F1 breaks the barriers without breaking the bank, and it's this sort of approach that will make Native Instruments a heavyweight in the hardware market.